Why Are People at Museums? What place do these ancient relics have in modern society? The current museums are absolutely all about Art, but no one there seems to be able to explain what that means. Modern art museums typically lead us into galleries set out under headings such as ‘The Nineteenth Century’ and ‘The Northern Italian School’, which reflect the academic traditions in which their curators have been educated. We spoke to people who went to Art museums after they returned home from their trips to figure out what place they may still have in today's modern world. 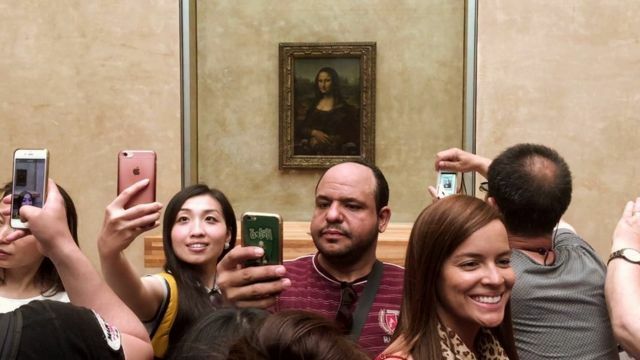 *This is Jonathon in the center taking in the glorious nuance of Mona Lisa's smile. He goes on to point out how all the visitors at the museums would the same thing, which is undeniable, but still the question had to be asked: "why?". Sebastian and his wife Esmerelda told us they found the outside of the museum to be just as, if not more enchanting than the inside. After seeing some art and what-not they stumbled outside upon a private nook that was beautiful! The facade of the building made a great backdrop for an impromptu photoshoot that made their whole trip "Totally worth it." "not everyone is comfortable enough with themselves to stand in a crowd and take the 15 or 20 pictures necessary to get the best one for others to see later online"
- which explains why she always gets such great pics of herself in front of artwork, which also seems to be what is going on at most museums today. Without the pictures, it's like you didn't even go there.